The Vikings who established homes in the lands they conquered during the 9th-11th centuries AD used a settlement pattern that was based primarily on their own Scandinavian cultural heritage. That pattern, contrary to the image of the Viking raider, was to live on isolated, regularly spaced farmsteads surrounded by grain fields. The degree to which the Norse and their following generations adapted their agricultural methods and living styles to local environments and customs varied from place to place, a decision that influenced their ultimate success as colonists. The impacts of this are discussed in detail in the articles on Landnám and Shieling. A model Viking settlement was located in a place near the coastline with reasonable boat access; a flat, well-drained area for a farmstead; and extensive grazing areas for domestic animals. Structures in Viking settlements—dwellings, storage facilities, and barns—were built with stone foundations and had walls made of stone, peat, sod turfs, wood, or a combination of these materials. Religious structures were also present in Viking settlements. Following the Christianization of the Norse, churches were established as small square buildings in the center of a circular churchyard. Fuels used by the Norse for heating and cooking included peat, peaty turf, and wood. In addition to being used in heating and building construction, wood was the common fuel for iron smelting. Viking Communities were led by chieftains who owned multiple farmsteads. Early Icelandic chieftains competed with each other for the support from local farmers through conspicuous consumption, gift-giving, and legal contests. Feasting was a key element of leadership, as described in the Icelandic sagas. The traditional Scandinavian farming economy (called landnám) included a focus on barley and domesticated sheep, goats, cattle, pigs, and horses. Marine resources exploited by Norse colonists included seaweed, fish, shellfish, and whale. Seabirds were exploited for their eggs and meat, and driftwood and peat were used as building materials and fuel. Shieling, the Scandinavian system of pasturage, was practiced in upland stations where livestock could be moved during summer seasons. Near the summer pastures, the Norse built small huts, byres, barns, stables, and fences. In the Faroe Islands, Viking settlement began in the mid-ninth century, and research on the farmsteads there (Arge, 2014) has identified several farmsteads that were continually inhabited for centuries. Some of the farmsteads in existence in the Faroes today are in the same locations as those settled during the Viking landnám period. That longevity has created 'farm-mounds', which document the entire history of Norse settlement and later adaptations. Toftanes (described in detail in Arge, 2014) is a farm mound in the village of Leirvik, which has been occupied since the 9th-10th centuries. Artifacts of Toftanes' original occupation included schist querns (mortars for grinding grain) and whetstones. Fragments of bowls and saucepans, spindle whorls, and line- or net-sinkers for fishing have also been found on the site, as well as a number of well-preserved wooden objects included bowls, spoons, and barrel staves. Other artifacts found at Toftanes include imported goods and jewelry from the Irish Sea region and a large number of objects carved from steatite (soapstone), which must have been brought with the Vikings when they arrived from Norway. 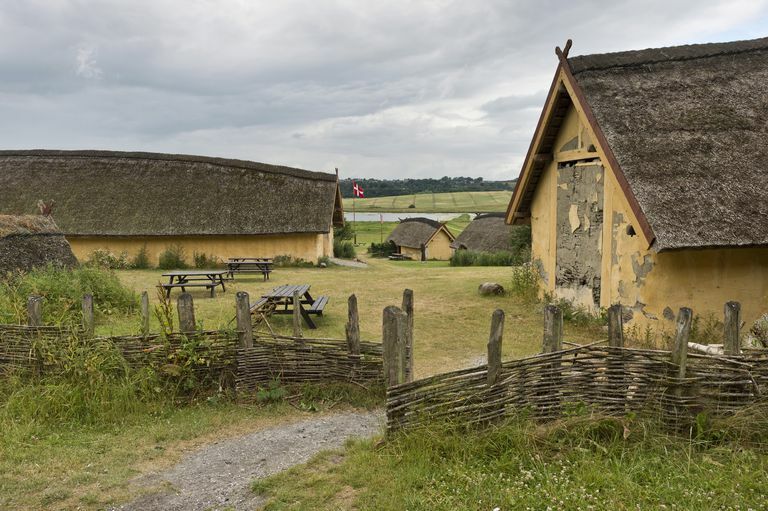 The earliest farm on the site consisted of four buildings, including the dwelling, which was a typical Viking longhouse designed to shelter both people and animals. This longhouse was 20 meters (65 feet) in length and had an internal width of 5 meters (16 ft). The curved walls of the longhouse were 1 meter (3.5 ft) thick and constructed out of a vertical stack of sod turfs, with an outer and inner veneer of dry-stone walling. The middle of the western half of the building, where the people lived, had a fireplace that spanned nearly the entire width of the house. The eastern half lacked any fireplace at all and likely served as an animal byre. There was a small building constructed off the southern wall that had a floor space of about 12 square meters (130 ft2). Other buildings at Toftanes included a storage facility for craft or food production that was located on the northern side of the longhouse and measured 13 meters long by 4 meters wide (42.5 x 13 ft). It was constructed of a single course of dry-walling without turfs. A smaller building (5 x 3 m, 16 x 10 ft) likely served as a firehouse. Its side walls were constructed with veneered turfs, but its west gable was wooden. At some point in its history, the eastern wall was eroded by a stream. The floor was paved with flat stones and covered with thick layers of ash and charcoal. A small stone-built ember pit was located at the eastern end. Adderley WP, Simpson IA, and Vésteinsson O. 2008. Local-Scale Adaptations: A Modeled Assessment of Soil, Landscape, Microclimatic, and Management Factors in Norse Home-Field Productivities. Geoarchaeology 23(4):500–527. Arge SV. 2014. Viking Faroes: Settlement, Paleoeconomy, and Chronology. Journal of the North Atlantic 7:1-17. Barrett JH, Beukens RP, and Nicholson RA. 2001. Diet and ethnicity during the Viking colonization of northern Scotland: Evidence from fish bones and stable carbon isotopes. Antiquity 75:145-154. Buckland PC, Edwards KJ, Panagiotakopulu E, and Schofield JE. 2009. Palaeoecological and historical evidence for manuring and irrigation at Garðar (Igaliku), Norse Eastern Settlement, Greenland. The Holocene 19:105-116. Goodacre S, Helgason A, Nicholson J, Southam L, Ferguson L, Hickey E, Vega E, Stefansson K, Ward R, and Sykes B. 2005. Genetic evidence for a family-based Scandinavian settlement of Shetland and Orkney during the Viking periods. Heredity 95:129–135. Knudson KJ, O’Donnabhain B, Carver C, Cleland R, and Price TD. 2012. Migration and Viking Dublin: paleomobility and paleodiet through isotopic analyses. Journal of Archaeological Science 39(2):308-320. Milner N, Barrett J, and Welsh J. 2007. Marine resource intensification in Viking Age Europe: the molluscan evidence from Quoygrew, Orkney. Journal of Archaeological Science 34:1461-1472. Zori D, Byock J, Erlendsson E, Martin S, Wake T, and Edwards KJ. 2013. Feasting in Viking Age Iceland: sustaining a chiefly political economy in a marginal environment. Antiquity 87(335):150-161. Why did the Viking settlement on Greenland fail? 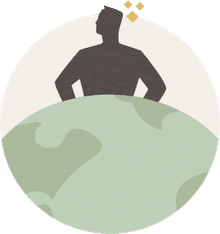 Hunter Gatherers: Who Needs to Plant Crops or Raise Animals?